The Chromebook has found its sweet spot, and it's around the $279 range where the Toshiba CB35-A3120 Chromebook resides. It sure isn't down in the dumps with the $200-or-so cheapies, with their clackety plastics and sorry little screens. Nor is it in the 1-percenter fantasyland of the gorgeous and expensive Chromebook Pixel. The $250 Samsung Chromebook 3 is nice, and if you jumped to $300 you could get an 11-inch touchscreen in the Acer C270P, or a 14-inch (non-touch) display in the HP Chromebook 14. But for $279, the Toshiba CB35-A3120 is nearly as good as those higher-priced competitors. It's also a notch better than the like-priced HP Chromebook 11, despite the latter's many charms (and much simpler name). What the Toshiba CB35-A3120 has over the HP Chromebook 11 are a much larger, 13.3-inch LED backlit display, a mobile-friendly Intel Celeron 2955U (Haswell) processor, and a 52Wh, 4-Cell Li-Ion battery. Performance is good, scoring 2910 in Peacekeeper. The battery lasted almost 7 hours in our tests--nearly identical to the HP Chromebook 14's result (also sporting Haswell, plus a 51Wh, 4-cell battery), and noticeably longer than what the HP Chromebook 11 achieved with its ARM processor and 30Wh battery. The CB35-A3120 also trumps the Chromebook 11 in connectivity, sporting two USB 3.0 ports (the HP has just USB 2.0) as well as an SD card slot, headphone jack, and HDMI-out port. Wi-Fi 802.11a/g/n and Bluetooth 4.0 are built-in, and a webcam and microphone sit atop the display. Built-in stereo speakers deliver tolerably tinny sound. I always feel cramped on the 11-inch displays of most low-end Chromebooks. The wide, 16:9 aspect ratio of the CB35-A3120's display keeps the device compact (8.9 by 12.9 by 0.80 inches), unlike the decidedly bulkier HP Chromebook 14. The 1366-by-768-pixel resolution is nothing special, nor is the occasionally choppy-blocky video playback (it supports 720p), but this is typical for the price range, unfortunately. At this price you also get a "Sunray Silver" plastic chassis whose dotty-textured surface is both attractive and easy to grip. I dislike the slight bendiness to the display lid, but the bottom half is nicely stiff. The 3.3-pound weight is very easy to tote. Most low-end Chromebooks have crummy keyboards: hard plastic, hard travel. The CB35-A3120's island-style keys are hard, but the softer travel was a pleasant surprise--heavy typists will appreciate the difference. The top-row function keys and lower-right cursor keys are half-sized, but usable. The clickpad is roomy and pretty responsive. 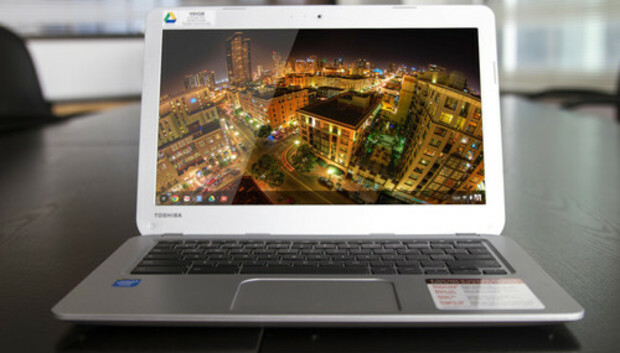 The Chromebook's other features include 2GB of DDR3L 1600MHz memory and a 16GB SSD. You get 100GB free on Google Drive but for only 2 years, so prepare for the end. Chromebooks are hitting their stride. With the Toshiba CB35-A3120 Chromebook, there's now a handful of models I'm actually willing to recommend. My current attainable favorite (that is, not the Chromebook Pixel) is the HP Chromebook 14. But for greater portability, competitive attributes, and slightly less cash, the CB35-A3120 is a tempting alternative.